Christopher McCollum was aged 16 when he died on the 8th September 2001. He was born with a life limited disability called Duchenne Muscular Dystrophy. This though was only diagnosed at age 5 and he began using a wheelchair from age 8. He was an only child to parents Gerry and Geraldine. Despite the progression of Muscular Dystrophy he remained a very happy boy, with a wonderful smile. He was an inspiration to his parents and everyone he met. He received great support from many people, his church and his school, other charities and in particular from Manchester United Football Club. 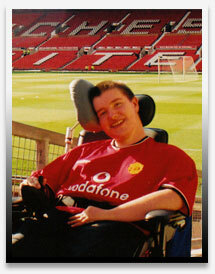 The support from United was vital as, sadly in his latter years, he experienced delays in wheelchair provision. This had a profound effect on his quality of life. His parents have set up The Christopher McCollum Fund to promote public awareness on how the effects such delays can have on young people aged 18 and under and to highlight how much other charities can benefit their quality of life.